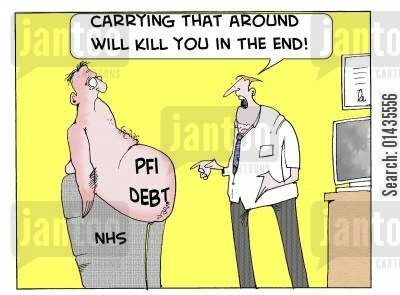 NHS / PFI ? The Chickens Are Coming Home To Roost ... At OUR Expense ! The NHS is "leaking" money to private companies in contracts to build and run hospitals, a report says. Under the Private Finance Initiative (PFI), companies provide money for new hospitals and then charge annual fees. The Centre for Health and the Public Interest (CHPI) publication - based on 107 PFI contracts in England - said such companies had made pre-tax profits of £831m in the past six years. The Department of Health said less than 3% of the NHS budget was spent on PFI. Companies that have built NHS hospitals under the private finance initiative have made pre-tax profits of £831m over the past six years and are poised to make almost £1bn more over the next five years. Large sums that could have been used for patient care have instead gone into the pockets of a handful of PFI companies at a time when the health service is starved of funding, according to the Centre for Health and the Public Interest. Its analysis, published on Wednesday, found that if the NHS had not been paying pre-tax profits on PFI schemes between 2010 and 2015 inclusive, the deficits in its hospitals would have been reduced by a quarter. Expected payments to PFI companies in the form of pre-tax profits over the next five years constitute 22% of the extra cash the government has promised the NHS between 2016-17 and 2020-21, it says. The age old argument rearing it's head ahead ... investing in public services by the use of private sector monies. There is a price to pay as many are finding out. Just how much constitutes the " Price " is yet to be determined ... but the interest and other costs will be reflected in all budgets ... whether it be schools or hospitals. Any mps with vested interests in PFI investment vehicles ? There is no easy answer to this one. Last edited by Chris From The Gulag on Tue Sep 25, 2018 2:16 pm, edited 3 times in total. Re: NHS / PFI ? The Chickens Are Coming Home To Roost ? PFI is bankrupting Britain. But there are ways to set ourselves free. Worth reading if only for one side of this ticking bomb. For an individual , it is no good complaining just how much your brand new dream home is costing if you mortgaged yourself to the hilt to acquire it ! I am not an advocate of PFI but ... we are all stuck with it now. Looking back , it is easy to change history to produce a different outcome , we all do that. However , this is the stark reality for us and for the generations to come. Last edited by Chris From The Gulag on Tue Sep 25, 2018 1:51 pm, edited 1 time in total. This has been happening for some years in education. One large local special school near me, which is co-located with a mainstream secondary in a "state of the art," building that looks nothing like a school, has to pay a fine if any teachers are late leaving at lock up time. They have to pay extra to have access to the building for parents evenings, meetings and teachers going into the building during school holidays. The private company sets the rate and this is an additional drain on an already over stretched budget. As they rent the building, they will never be free of this additional expense. The only cost to an ordinary school would be overtime for the caretaker/ a relief caretaker to open up and lock up and running costs. The whole PFI scandal needs a high court case to establish that these contracts are 'unfair' and have them set aside. As for Gordon Brown (who, I believe, invented PFI, and if not him, then he certainly loved it as it kept his damn Public Sector Borrowing Requirement figures nice and low for the stupid electorate....)(!!!! ), he deserves to be dumped in a hospital that can't afford nurses and doctors and medical kit because it's in hock to PFI rip off merchants (a lot of these contracts were sold on long ago on the casino capitalism market, and the money is paid out to companies owned abroad etc etc etc - totally scandalous). Many PFI recipients have paid up to eight times the actual cost of the original build, in sheer profit to the PFI lenders, and the maintenance contracts that went with the build contracts are outrageous. Hence the need for them to be contractually set aside. Every lender of money needs to have a 'fair return' - but the PFI contracts were, of course, back end loaded - ie, little to pay at the start, to make them look good - but have landed the debtors into decades and decades of debt. PFI is the 'payday lending' of the health and schools sector. Absolutely and totally outrageous. I feel sorry for the chief execs of the time though. I can remember a File on Four Radio 4 programme once interviewing one of the first hospital CEOs to use PFI - he said he was ordered by the government to accept a contract that no sane business person would EVER sign, it was so ruinous. Jeremy Corbyn, if he had any gumption at all, would promise to have them ALL set aside. The lenders have already made shedlods of money out of taxpayers - enough is enough. After a brief summer break ( Where was summer this year ? ) , our local astronomy society recommences fortnightly meetings tonight at a local school built with PFI funds. Throughout the year , various appeals have been made to parents and local wellwishers for monies to purchase necessary furniture and equipment as the school has literally run out of working capital as the PFI costs have bitten , and projected to rise even further. Tonight , a few members will be bringing their own computer orientated equipment in case the school's equipment remains either offline or awaiting replacement. Turn the clock back a few years and ... yes , we have a chalkboard but unable to afford the chalk ? If this pattern is repeated across other PFI funded investments in the UK .... ??? When did they start to go wrong ? Initiated by the Conservatives but expanded and championed by Gordon Brown when he was Chancellor, the Private Finance Initiative was designed as a way to build new hospitals – without the capital costs ending up on the Government's books. Under the scheme private companies financed and built new hospitals and leased them back to the NHS over a period of up to 30 years. But PFI has been roundly criticised for providing poor value for money and leaving hospitals with unsustainable annual rents and costs for providing services such as cleaning and maintenance. The Government has now promised to try and renegotiate some PFI contracts but ministers have a poor negotiating hand. In order to get banks and private companies to lend the money in the first place, the Treasury had to underwrite all the risk of the projects. So even if a PFI hospital closes the tax payer is still responsible for keeping up the payments. Now 2017 and .... the PFI time bomb is close to detonating ! Off balance sheet liabilities ? The financial meltdown in 2008 ring any bells ? Last edited by Chris From The Gulag on Tue Sep 25, 2018 1:52 pm, edited 1 time in total. GPs are being urged to get backing from a panel of other doctors in order to refer patients to hospital as part of a secret cost-cutting drive, it has been reported. A leaked NHS England memo tells health trusts to review referrals weekly by September in a bid to cut numbers by about 30%, according to Pulse magazine. Pulse, a specialist publication for doctors, said the leaked document promised “significant additional funding” for clinical commissioning groups (CCGs) who established the schemes this year. The magazine said individual GPs would still be responsible for making the final decision over the referral process and the peer review would represent good practice to ensure that “all options are explored and that patients are seen and treated in the right place, at the right time and as quickly as possible”. An NHS England spokesman said: “Clinical peer reviews are a simple way for GPs to support each other and help patients get the best care, from the right person, at the right time without having to make unnecessary trips to hospital. A case of deciding what is fact , and what is fiction ? Only time and personal experience will reveal ! Needless to say , very biased but ... very apt ? As the Tories slash the health service, eight multinational corporations are leeching millions in profits from the NHS. In the last six years alone, they have taken £831 million from the NHS through Private Finance Initiative (PFI) hospital building projects. The Centre for Health and the Public Interest’s new report, PFI—Profiting from Infirmaries, lifts the lid on this scam. This is money that could have been spent on patient care. It also comes as the Tories try to slash £22 billion from the NHS in England by 2020—and deny nurses and other health workers a pay rise. PFI schemes were first brought in by John Major’s Tory government in 1992 to fund building hospitals, schools and other public infrastructure through using the private sector. They mushroomed after New Labour got into office in 1997. They were justified as a quick way of building hospitals, but PFI was a way of cooking the government’s books. It is health workers and patients that have to pay the price for this costly con-trick (see below). The “capital value” of the hospitals that have been built is £12.4 billion—but hospitals will pay private companies £80.8 billion for using them. The report notes that University College London Hospital (UCLH) is “particularly concerning”. Buying assets on the " Never never " ? What conclusion would YOU draw ? The Piper ... doesn't play for free ! Last edited by Chris From The Gulag on Tue Sep 25, 2018 1:53 pm, edited 1 time in total. What is the Private Finance Initiative? And do Labour's plans to take it back 'in-house' make any sense ? What are PFIs? Have they really been a scandal? Is Labour's pledge financially feasible? And would it be desirable ? One for any reader interested to read it full ... one of those articles which actually flows. Part of the justification for PFI in the eyes of national politicians was that it produced new capital investment which did not have to accounted as debt accruing to government departments. Instead it was individual NHS trusts or local education authorities which bore the cost of financing the debt, which as we have seen has plunged many NHS trusts into deficit. But just as important is the democratic deficit which has been created.In many cases it has taken power of decision away from elected representatives at local level and handed it to the companies providing the finance. As someone who had been involved in planning school provision for a local authority , I have seen the way in which sound educational principles associated with the building of new schools were discarded to satisfy the requirements of a PFI provider. Whatever ... a sleeping timebomb ... for the time being ? Off balance sheet liabilities ... Lehrman Bros. ... 2008 ... ring any bells ? “WE’RE bringing ’em back,” cried John McDonnell at Labour’s Brighton conference, referring to the country’s 700 private finance initiative deals. Perhaps he’d been catching up on old copies of the Eye. Back in 2014, after Northumberland NHS Foundation Trust bought out its PFI contract from a consortium called Catalyst, Eye 1369 suggested that “all PFI deals need a rethink”. So expensive had the deal been for Hexham general hospital that the trust could borrow from the local authority to buy out the backers – who landed a £15m one-off profit – and still save around £3.5m a year, or £65m in total over the remaining life of the contract. This precedent disproves much ill-informed reaction to McDonnell’s announcement to the effect that the measure could not save money. Especially if the writing is on the wall for PFI, many operators will be willing to take a discount on their future profit margin in returning for getting their money out – plus a decent profit anyway – now. It won’t be easy, however. The cash to fund the buyouts will have to be found somewhere, probably forcing a Labour government to relax borrowing constraints on public bodies. Then will come the unpicking of fiendishly complex contracts to arrive at the right compensation figure. This is where the architects of PFI will come back in. The same consultants who did so much to create the initiative and have earned hundreds of millions of pounds setting up PFI contracts will be called on to crunch the buyout numbers. Deloitte, which has been behind many hospital deals, did the job for Northumberland. The health service, however, accounts for only a fifth of PFI deals. In other areas, such as schools, local authorities may decide their contracts are too small to justify the upheaval. In others, such as defence, there could be another problem. Deals like the 25-year contract to supply in-flight jet-refuelling aircraft – with a capital value of £2.7bn, worth two and a half times the largest hospital deal – can’t be brought entirely “back in-house” as McDonnell put it. The PFI consortium in that case, made up of Airbus, Rolls-Royce and Thales, would end up running the project anyway and would be unlikely to offer much of a discount to walk away from owning the deal. The plan is thus likely to translate into the return of a minority of deals to the government with some useful savings, while providing another earner for the usual consultancy suspects. McDonnell’s other idea, of intervening “immediately to ensure that companies in tax havens can’t own shares in PFI companies” (again an issue exposed in the Eye), could prove a bumper payday for m’learned friends. While stopping new deals going offshore has long been possible, reversing history will be another matter. PS: IF ONE Labour MP had got his way a decade ago, there would have been another “rip-off” PFI scheme to bring back. In 2006 a new PFI hospital was proposed in Hillingdon, west London. Alas, it was delayed by a review of the use of PFI, which had by then started to prompt serious concerns. Debating health services in parliament, the local MP chipped in. “We have a proposal for the PFI scheme for Hillingdon hospital,” he said. “I am not supportive of PFI schemes but if this is the way to secure the money, fair enough.” Although there was “a blip in terms of the Treasury review of the PFI”, the MP ventured hopefully that “this could be an opportunity not to delay the scheme, but secure it and consider an alternative site”. While several stalled PFI schemes did go ahead, the Hillingdon one was scrapped. Which at least spares the blushes of the MP who wanted it to go ahead… one John McDonnell. On the Internet , there is NO hiding place .... thankfully !